How damaging is the dramatic increase of English loan words and morphology entering the language of the Polish community in the UK? 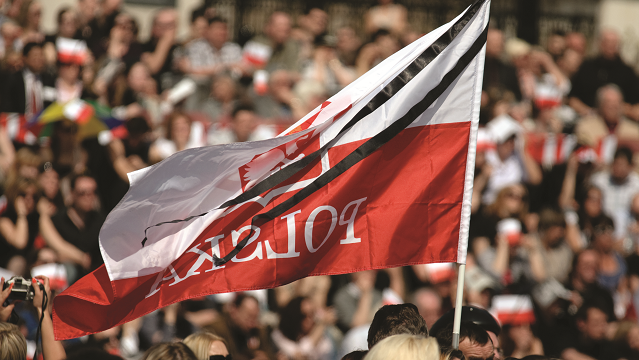 The Polish-speaking community is one of the largest foreign communities in the UK. Most Poles living in Britain communicate in both Polish and English on an everyday basis. The level of English competence differs, but there is a strong degree of anglicisation of Polish across the entire community. The influence of English on Polish dates back to the turn of the 18th century, but it gained momentum after Poland opened its borders to the West in 1989, and again in 2004 when it joined the European Union. Free movement of people translated into free movement of words, with terms gaining new meanings and a new morphology appearing. Word migration has become a popular topic in linguistic publications.1 In 2006, Mańczak-Wohlfeld recorded more than 1,700 borrowings (or ‘loan words’),2 gathered from multiple dictionaries. As English terms continue to enter Polish, the neologism Ponglish has emerged. But does the native language of the Polish community in the UK suffer from being anglicised? A search of internet forums and blogs suggests that the language is becoming ‘less Polish’ with the adoption of expressions such as ‘hi!’, ‘hello’, ‘yes’, ‘yep’, ‘nope’, ‘see you’, ‘ok?’, ‘nicely done’, ‘no way’ and ‘please’, and the over-use of possessive pronouns, as in zjedz swoją kanapkę! (‘eat your sandwich!’). In daily contact, people tend to introduce themselves using English versions of their names, so we hear ‘Peter’ for ‘Piotr’ and ‘Margaret’ for ‘Małgorzata’. To find out more, I conducted an informal inquiry with 80 people aged 15-65; eight out of ten admitted to using English expressions because they were more attractive, modern and simple to apply. When asked, “Why do you send text messages in English?” the frequent response was, “Because it is easier and faster to type.” Poles, unquestionably, did not want to sound ‘outdated’. Moreover, English has penetrated Polish in business (‘marketing’, ‘trade’, ‘exchange’) and technology, especially the IT industry (‘click’, ‘cloud’, ‘computing’). Polish people use English words in cases where there is no translation available (‘double-click’ and ‘hashtag’ rather than the strange-sounding podwójne kliknięcie and dwupstryk) or when the English form represents a shorthand (e.g. ‘weekend’ instead of koniec tygodnia). Young people tend to mix words or add Polish suffixes (sometimes prefixes too) to English words, e.g. overtimów (‘overtime’), zaczekowałem się (‘I have checked in’), w undergroundzie (‘at the underground station’) and wystajlowany (‘styled’). Young children, in particular, create neologisms with the aim of quick and easy communication. Neologisms (often with previously incorrect morphology), such as banowa (‘to ban something’), have become an accepted norm. Young Poles in the UK go to schools and institutions where English is the primary language, and speaking Polish at home is not sufficient for them to gain full knowledge of the language. My interviews with many Polish families show that only a few invest time in language-related activities, such as writing and reading practice and introducing idioms. Only some attend extracurricular Polish classes. English is used where the Polish is not known, often due to a lack of knowledge of sophisticated vocabulary. Most young Polish speakers in the UK are not aware of traditional Polish sayings, such as Idzie luty, podkuj buty! (‘February approaches: make sure you have something warm to wear!’). Striking English loan words from Polish would be impossible. The renowned Polish linguist Jan Miodek3 acknowledged the importance of borrowings, stating “There are no words that the language would not need”. Languages are flexible and expand in their natural course, so Polish is developing by incorporating parts of English speech, but it is up to Polish people to retain control over which words and phrases we adopt. Joanna Biernat-Sowka MCIL is a Services Manager in Consulting Services at Qlik and a German tutor.